It's August already! Lughnasadh (also called Lammas) falls on August 1, and is an Irish celebration honoring the first harvest of the season. What in our own lives do we feel we can now harvest after seed planting in the early spring and tending all throughout the hot days of summer? At Benincasa the Daniel Berrigan Center for Art and Activism continues to bear great fruit. In the last few months we had the privilege once again of hosting people from the Amazon fighting for their land and culture rights and anew friend from Australia sharing her wisdom from a lifetime of relationship with Mother Mary and Mother Earth. 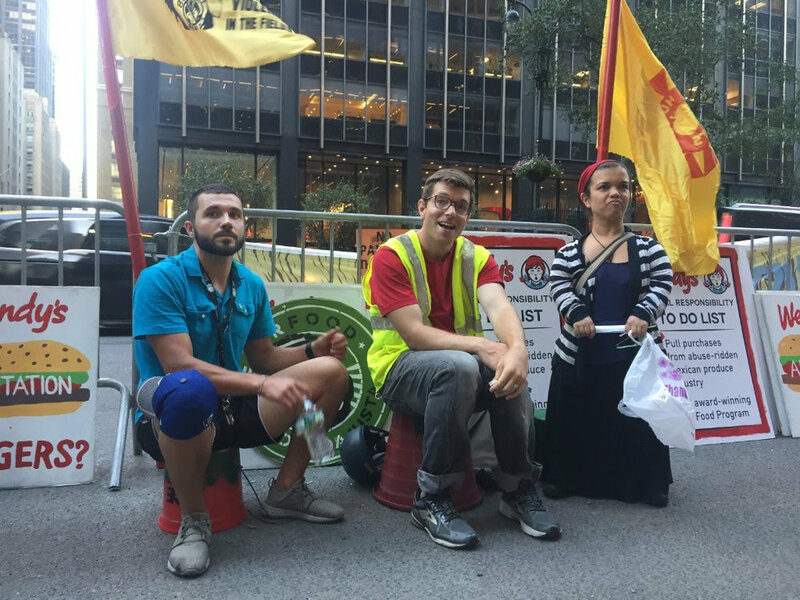 We supported and stood with theCoalition of Immokalee Workers and Alliance for Fair Food as they again took their demands for decent wages and safe working conditions, free of sexual violence, to Wendy’s doorstep. In total, we welcomed more than 30 people to stay at Benincasa during the months of June and July (some for a week, others for a month). In August, we will take some time off to enjoy rest, refocus, and reflect on the growth these visitors have instilled in our lives. ﻿In September, Benincasa will be launching its inaugural lay formation program, Through Every Age (TEA). With a cohort of 13 participants and the support of an amazing team including, Clare Nolan, R.G.S., Margaret Galiardi, O.P. and Jamie Manson, M.Div., the program will take place over the course of 9 months with 4 retreats and daily material intended to develop the practices of study, prayer, community, and action for people drawn to the Catholic tradition. Our 3rd floor rooftop garden is in full glory with peppers, tomatoes, flowers, and herbs ripe and ready for picking. And, work at the farm keeps on going with plenty to harvest and the groundwork for future plans to develop an outdoor spiritual classroom in its beginning stages. With family visiting, new projects taking flight, and drops of warm weather to embrace, we wish everyone an abundant harvest and peaceful close to these summer months! Benincasa Community is seeking up to three graduate students studying/working toward peace, justice, and equity in afaith-based or faith-led context. Their contribution to Benincasa Community will be a critical support for us! We are seeking kind, friendly, studious people who value stewardship and take good care of their property and their home. We offer a room with adesk, access to our roof garden, the opportunity to join us on Sundays for liturgy and our community meeting, and dinner on most evenings. If you or someone you know might be interested in joining us for the year, please email Karen, karen@benincasanyc.org, for more information. Spend a few minutes enjoying music to keep the movement going. The perfect song to celebrate la lucha for our collective liberation.